New construction, a family memorial and the challenge of languages in India | Walk with us! ← A welcoming, and a birthday celebration! 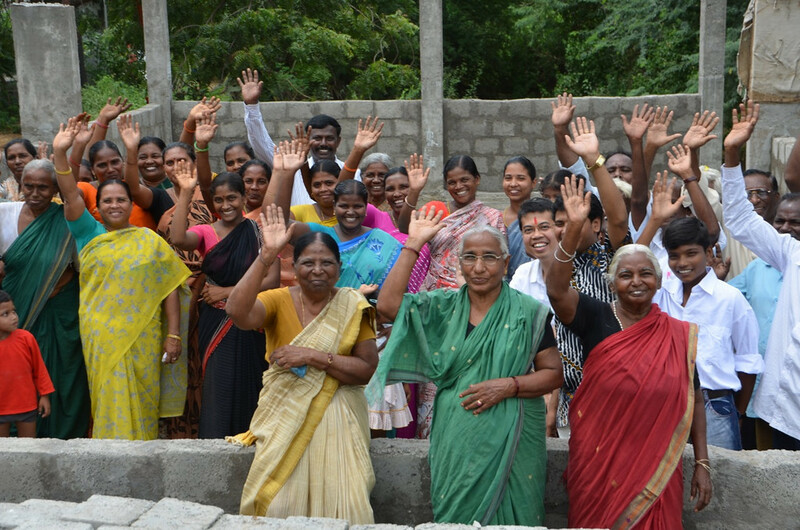 Parishioners stand in the foundation of their evolving sub-station church in Nambur. The photo was taken before Fr. Tom’s visit; more work has been done than what is seen here. The day before leaving the novitiate for Gorantla I met with Fr. Dharam, pastor of Sacred Heart Parish & Shrine in Nambur. In addition to the main church there are either two or three sub-stations. Two of the sub-stations are not all that far apart from one another but a six-lane highway makes it difficult to go from one church to the other for many of the families. One of the sub-stations meets in a school and that works out fine for them, but the other has less favorable conditions and so the decision to build. Up until now all the work on the church has been paid for by the parishes members themselves. The walls are up and the window frames are in. Fr. Dharma hopes to put the roof on in the next week or two. That may be slowed as he was admitted to the hospital yesterday suffering from dengue fever. He told me he had not been feeling well for the past few days, thinking he was suffering from a cold. Last January I was present for the dedication of Sacred Heart Church in Nambur. The US Province donated funds to help pay for its construction. Fr. Dominic Peluse and Pam Milczarski from our development office were also present for the dedication and festivities. Fr. Dharma hopes to dedicate the new church on January 26, 2015, the same date chosen for the dedication of Sacred Heart last January. I am now back in Kumbalanghi and will stay until we head to Mysore for the chapter. I think we will leave here on the 12th as the chapter will start on my birthday October 13th. Fr. Thomas Vinod told me I’d finally get my bus ride as it is a six-hour bus trip from here to Mysore. We will be using the facilities of the Pallottine Centre for Theological and Religious Formation. I am hoping that while I am here in Kumbalanghi I’ll be able to visit our house of philosophy in Aluva and a parish we have in Punalur. I did visit Aluva on my first trip to India in 2011, but our work at Punalur is unknown to me. I met one of the young priests from Punalur, Fr. Kasmir Joseph, who is spending the day here. He described Punalur as a place few come to visit as it is off the beaten path. I will also use this time to get ready for the chapter. It will only last for five days and there is a lot of material to cover. It will be interesting to see how things operate as this is my first experience at a large official gathering of Indian SCJs that I will be a part of. From my time in Rome I’m well aware that cultures have their own way of doing things and certainly that is true in India. The language will be English, but the accent will be Indian. Yesterday I was asked if I would like to come with the SCJ community to attend the one-year anniversary memorial service for the father of Br. Xavier Viju. Br. 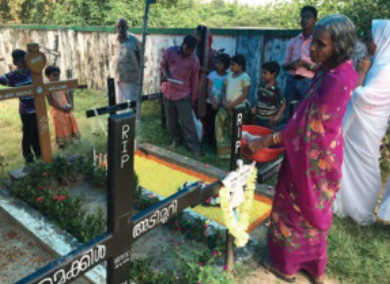 Xavier comes from the nearby village of Kumbalam The custom here among the Indian Catholic community is to celebrate memorials for the deceased seven days after death, followed by 30 days and finally 365 days. Fr. Thomas Vinod was the main celebrant and the words (spoken at the start of Mass rather then after the gospel) were by Fr. Solomon Siju. After Mass we walked to the parish cemetery for a graveside service. Both Kumbalanghi and Kumbalam are very close to the sea so I suspect the water table is close to the service so burial tends to be shallow. White is the color a widow wears, though the vestments for Mass were purple. The cemetery was about one kilometer (.62 miles) from the church. Most parishes have their own cemeteries though in some places several parishes may share a common cemetery. Once the graveside service concluded we walked back to church to get our vehicle and drive to Br. Xavier’s family house. The family would be serving a meal for family, friends and guests. A custom I am still not all that comfortable with is that the meal for the priests and religious was served separate. Our small parish has its Sunday morning Mass at 7:30, a time when Mother Nature tends to be kind to all as the sun has not had a chance to heat up the earth. Ceiling fans also help to keep it relatively comfortable in the church even though. 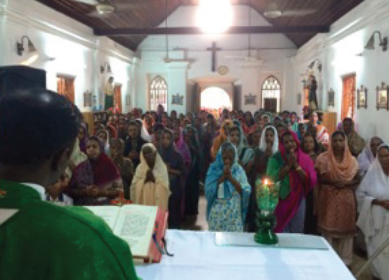 If you did not know India you would think only women come to church. While it is true you’ll find more women then men, it is the women who sit before the altar while the men sit in an area off to the side. There is not room in the main part of the church for all. There are four priests and one student regent assigned to the Kumbalanghi community. On any given day two or three of the priests will be out celebrating Mass. We take care of two convents on a regular basis (daily except for Sundays). One of the problems the district faces is the many languages spoken where we live and work. In Kerala it is Malayalam, which I am told is not an easy language to master. Both Frs. 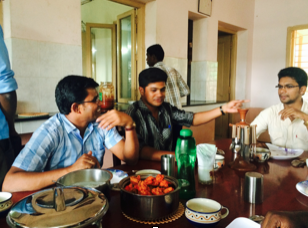 Vimal and Emmanuel come from Andhra Pradesh where Telugu is the official language.The main languages spoken in Andhra Pradesh are Telugu, Urdu, Hindi, Banjara, and English followed by Tamil, Kannada, Marathi and Oriya. Telugu is the principal and official language of the state. Because of the language situation pastoral work depends on what languages one knows and what language may be required. Unlike we Americans Indians tend to know several languages and dialects; it’s in the nature of the people and, of course, Mother Necessity helps out as well. Fr. Emmanuel, for example, has taught himself to read, write and speak Malayalam, something I would find extremely difficult at any age, but it just seems to come naturally to people who learn several languages from birth on.The language issue for the Indian SCJ District will get more complicated as it expands to other areas of India. Hindi will be important in many parts of the country, but even then the local language is the one more likely to be used in liturgical situations. In our houses of formation the language is English and the SCJs assigned to the formation communities are chosen for their aptitude in formation. On the other hand, when assigned to a parish in addition to the talents of the individual attention must be paid to the languages he speaks as that will be an important pastoral issue. Thank you Fr.Tom for your sharing about India.